Ceylon-German Technical Training Institute, which was established in 1960 with German assistance, to implement training programmes in conventional technologies, has been the main provider of skilled workers to the Sri Lankan industry, since its inception. However, due to the rapid advances in technology during the last three decades, it has become necessary to upgrade the training facilities at CGTTI, to keep it abreast of advanced technologies, which are fast becoming standard in the Sri Lanka manufacturing sector. Scarcity of skills in these technologies is in fact a major restraining factor in foreign investment in the BOI sector. 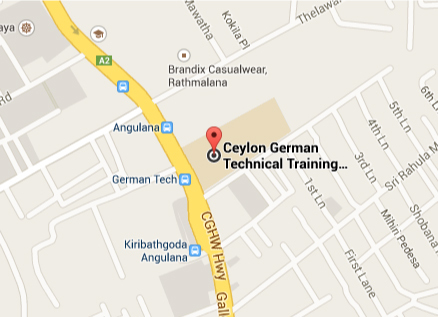 To enhance the training in advanced technologies, the Modern Technologies Training Centre was established within the CGTTI premises on 20th October 2004, under the bilateral agreement of February 22nd 2001 between the Federal Republic of Germany and the Government of Sri Lanka. Cooperation with public and private industries to train technicians in the field of precision engineering with Computer Numerical Control (CNC) machinery to obtain high productivity, efficiency and accuracy. Highly qualified CNC technicians of Sri Lanka will get better paid jobs in abroad and will support growth of the economy of Sri Lanka. Target group: Students and Instructors of Vocational Training Institutes, CNC operators, supervisors in Tool machinery trade and university students. Target group: Students and Instructors of Vocational Training Institutes, mechanical & civil Draughtsman and university students.